Amid sunny skies, temperatures in the 80s, and stunning Hill Country views over 200 people took time out of their Saturday afternoon to attend Travisso’s Tuscany Home Tour and Fall Festival. The four-hour event held on October 29 gave those who came out the opportunity to fall in love with their dream home while touring 10 professionally decorated models and over 20 move-in ready homes. Individuals visiting six or more homes were rewarded with the chance to enter a raffle to win a $2,500 Restoration Hardware shopping spree. It was food, football and fun for everyone! The afternoon’s activities included a six-foot pumpkin spiced latte tiramisu, craft beers, and local wines produced in the Texas Hill Country. On the big screen festival goers watched the University of Texas Longhorns beat the Baylor University Bears while enjoying a variety of tailgating snacks. Laser tag, Halloween trick-or-treating, and a pumpkin patch rounded out a host of safe kids’ activities. 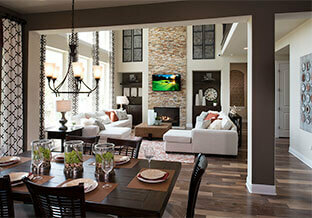 Photo opportunities were also available on a photo bus in the model home court courtesy of developer Toll Brothers. A great big thank you to Heart of Texas Lab Rescue (HOTLR) Inc. and Lifelong Friends Pet Adoptions for providing adorable dogs for our costume Howl O Ween parade. HOTLR is a nonprofit, all volunteer, Austin based organization that works to rescue and provide safe, loving, and caring homes for Labrador Retrievers. Located in Lago Vista, Lifelong Friends Pet Adoptions is a nonprofit animal shelter that works to find homes for cats and dogs. For additional information on either organization go to hotlabrescue.org or lifelongfriends.org. Home prices in Travisso range from the $300s to $800s. For additional information on Taylor Morrison, Toll Brothers, Highland Homes, Grand Haven Homes, and Drees Custom Homes visit Travisso.com. Travisso’s model home court is open Monday through Saturday from 10 a.m. to 6 p.m. and on Sundays from Noon to 6 p.m. Visitors to Travisso can stop by the Welcome Center for maps, information, and a hot cup of coffee Monday through Saturday 9:30 a.m. to 5:30 p.m. or on Sunday from 11:30 a.m. to 5:30 p.m.